NORO template mimics flawlessly the appearance & functionality of Metro design. The template also comes with latest technology in design – as always in any NooTheme template – Bootstrap, HTML5 and CSS3 supported. Especially, NORO is developed with a precise grid system. 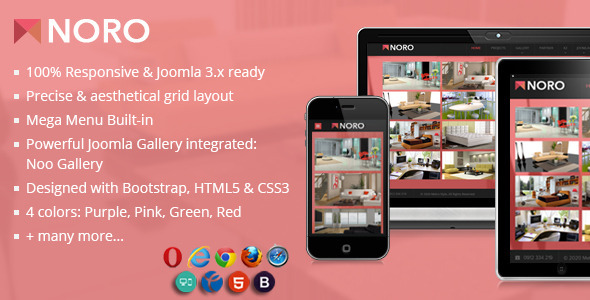 The grid layout brings a very balanced, structured and aesthetical look for NORO, no matter what the content is. Sophisticated layout structure from NORO offers more flexibility and enhances the visual experience of your site’s visitors. Provided with 4 colors: Purple, Pink, Green & Red so you can choose the fittest for your modern store.